Posted by Hillary Zhang on 1/11/2019 5:20:33 PM. An eTextbook is a digital, downloadable version of a printed paper textbook. And VitalSource eTextbooks have become a more affordable and practical option for educational needs. VitalSource Bookshelf eBook file is a VBK file. While there's a big disadvantage of VitalSource eTextbooks--You can't print the eTextbooks even if the book is PDF format delivered by the book store. And there are two different types of electronic textbooks sold in the VitalSource Bookstore: Epub and PDF. Therefore, in order to print VitalSource eTextbooks, you need to decrypt VBK file and convert Epub to PDF. So this article is going to introduce you the best VBK Converter. 1. How do I access my VitalSource eTextbook after purchase? Your eTextbooks are available immediately to you following your purchase. If you have purchased on vitalsource.com, you can access your books by clicking Read Now on the Order Confirmation page or by visiting the Bookshelf site. If you wish to access your books offline, you will need to download the Bookshelf application. Note that your login/account for VitalSource.com will be used to access your books in Bookshelf, you should not create a separate account. 2. What devices can I read an VitalSource eTextbook on? Read your textbooks on any computer, tablet or mobile phone. VitalSource Bookshelf is compatible with both Macs and PCs as well as iOS, Android, Kindle Fire, and Chromebook devices. 3. Can I print my eTextbook? Restrictions around the use of copy & paste and printing are set by the publisher on a title by title basis. You can view the restrictions on the Product Details page for the title purchased. 4. What eTextbook formats are available? There are two different types of electronic textbooks sold in the VitalSource Bookstore: EPUB and PDF. Reflowable textbooks do not maintain the layout of a traditional bound book. The text is responsive, so the font size can be easily adjusted no matter the size of the screen. These books conform to EPUB 3 industry standards. The Page-Fidelity textbook maintains the look and feel of a bound book—the text is fixed and the screen size determines the size of the text. Both types of eBooks support a wide range of features, including but not limited to: notes, highlights, text to speech, printing, syncing across devices, and more. Information about the book's format is available on the Product Details page for that title in the vitalsource.com store. Due to the limitation of DRM protection, VBK files are restricted to VitalSource Bookshelf software, which will be a very inconvenient for users. So we must get rid of the DRM to take the full control of our purchased VitalSource eTextbooks. Step 1, download Epubor VitalSource Downloader to your computer and launch it. Input your billing email to register Epubor VitalSource Downloader. Next input your VitalSource account and password in the log-in window. Then all of your ebooks will be displayed in the main window. 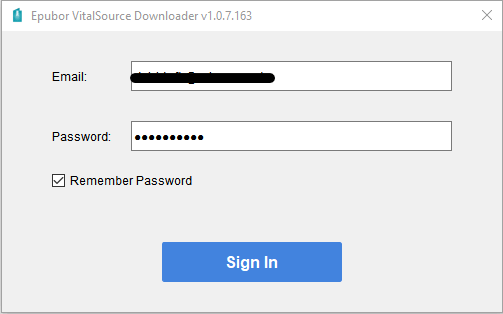 Note: If you are a trial version user, please close the registration window and use Epubor VitalSource Downloader directly. Step 2, click the download button in the lower right of the book cover to download the VitalSource eTextbooks to your computer. There will be a downloading progress bar below the book cover. You can only download one book at a time. So don't click on anything before the book was downloaded successfully to your computer. Step 3, it will pop up a reminding window when the book was successfully downloaded to your computer. When you close the reminding window, it will pop up a window contains the downloaded DRM free ePub or PDF files. 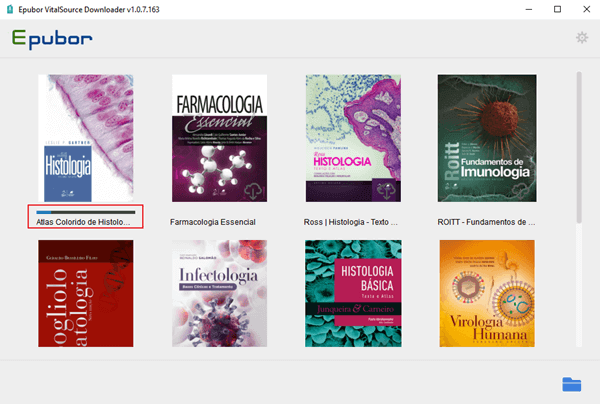 Tips: After downloading your VitalSource eTextbooks with Epubor VitalSource Downloader, you'll get DRM free Epub or PDF files(depends on the book type delivered by VitalSource). Then the books are at your disposal. Epubor VitalSource Downloader uses the VitalSource web viewer to scrape every page of the book and strips DRM from the book. It only requires one-click to download the whole book efficiently and save them as EPUB or PDF files(depends on the book type delivered by VitalSource) on your computer. If you get Vitalsource book downloaded as PDF format, you can print the downloaded PDF book as a whole with one-click! Even if you get the epub format books, you can read DRM free ePub on many devices. When you're not sure whether the VBK file is a ePub or PDF file, you can contact VitalSource customer service for help. 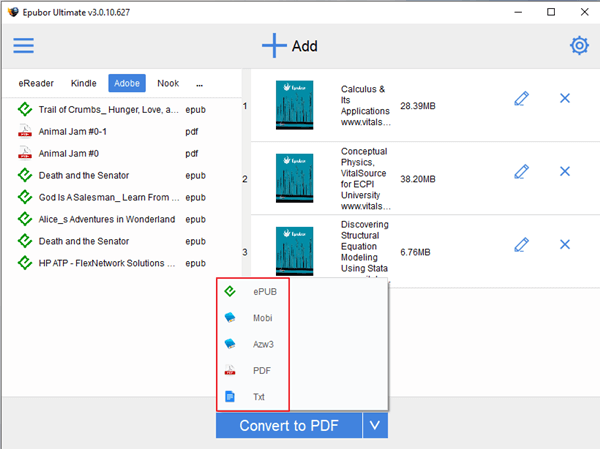 If you get a DRM free Epub book, while you want to get a PDF format instead in order to print the book, you can use another Epubor software--Epubor Ultimate to convert PDF to Epub for free. Below is steps about how to use Epubor Ultimate to convert DRM free VitalSource Epub books to PDF. Step 1, install Epubor Ultimate software to your computer and luanch it. 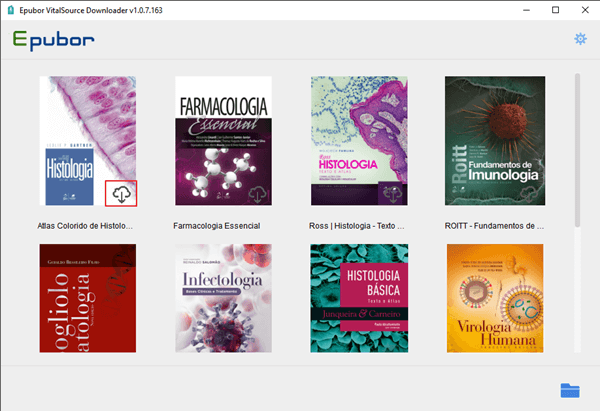 Step 2, drag and drop DRM free VitalSource Epub books to the main window of Epubor Ultimate software. Step 3, choose PDF as the output format and click Convert to PDF button to start the conversion. 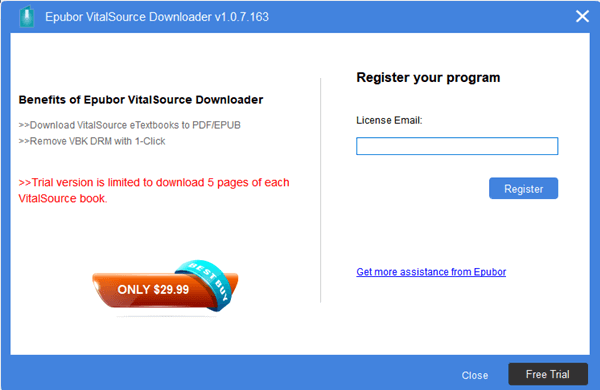 With Epubor VitalSource Downloader, you can get DRM free VitalSource PDF/Epub books. Then you can read them on any apps or devices which support Epub and PDF format. What's more, you can share the book with your friends or print them out after converting Epub to PDF using Epubor Ultimate.